Easily one of the most popular vehicles currently on display in the Transport Museum, tramcar No. 224 is in fact an impostor  but one with a splendid story to tell. DUTC tram No. 199 at Whitehall terminus in the first decade of the twentieth century. This car was a former trailer. Regrettably, the crew in this photo remains unidentified. During the brief period when horse and electric trams shared Dublins streets, some horse trams coming from Sandymount via Bath Avenue were attached to electric cars on the Dalkey route, continuing their journey from Haddington Road to the city centre as trailers. It was thus on the evening of 27th November 1898 when tram No. 64 took horse car No. 3 on tow at Northumberland Road, bound for Nelson Pillar. When the trams reached Merrion Square, a passenger on the upper deck of the electric car began to descend while the cars were in motion. He missed his step and fell between the two trams, suffering fatal injuries. Comprehensive reports of the accident were given at the inquest  the names of everybody involved are recorded  and on the advice of the jury, the Dublin United Tramways Company ceased using trailers. 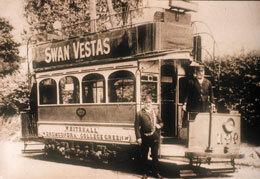 All 30 trailers were subsequently rebuilt as motor trams and some of them gave up to 20 years service in their new guise. A few had their canopies extended over the platforms and were fitted with windscreens; in tramway parlance, they were vestibuleda process which also increased the seating capacity by four. Dwindling numbers of open-fronted (unvestibuled) former trailers were to be seen during the teens of the twentieth century and the last one vanished around 1925, replaced by more modern stock. The London County Council Tramways also employed trailers, built by Brush of Loughborough, and all were withdrawn by about 1920. 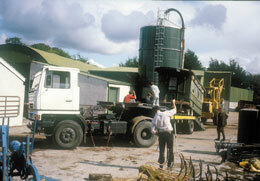 Many of the London trailer bodies had their upperworks removed and were rebuilt as horse-drawn caravans. 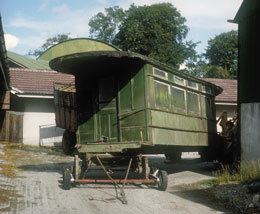 A former London trailer ended up on a farm near Abbeyleix where it remained for many years. One morning in 1982 the farmer, Mr. James Pratt, heard Gay Byrne extolling the work of the museum and phoned in offering the former trailer. Jim Kilroy immediately saw the possibility of rebuilding this vehicle as a replica of a Cork electric tram and so Frank Curran organised the removal of the very weathered tram to Dublin. Unfortunately, the shed in which restoration began went on fire and the tram was badly damaged. Because of the structural damage the car had suffered, further choices about its future guise opened up and widespread consultations took place. 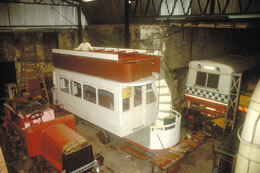 It was now possible to rebuild the vehicle as a Dublin trailer would have looked if the original builder had been Brush rather than Milnes. Work began again and as it proceeded further ideas were considered. There must be very few people who have not encountered the Joycean phenomenon and the ingenious efforts made every year to recreate Dublin scenes of Bloomsday, 16th June 1904. Here indeed was a fascinating challenge and a wonderful opportunity of showing how people travelled a hundred years ago. Further research was carried out and the vehicle was given an identity. It was established that Dublin tram No. 224, a former trailer, remained unvestibuled from 1900 until its demise around 1923. This number was given to the trailer, which had originally been London T124. There were no funds to purchase a motorised truck or chassis and so an interim plan was adopted A small solid tyred trailer had already been placed under No. 224 and this would have to suffice for the moment, so false tramway truck frames were fabricated, giving the tram a highly authentic appearance. 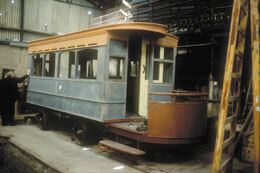 Jim Kilroy and his keen tram restoration team spent nearly ten years working on this vehicle. Because all the staff in Howth are volunteers and usually available only on Saturdays, the task took about five times that what would have been necessary if the job was undertaken in a full-time workshop. An amazing range of skills and achievements were involved  for example, the two staircases were fabricated by our own craftsmen, using cardboard templates to cut and form the metal. Some upper deck seats were donated for use as patterns, several frames were available and modified, but all the woodwork was carried out in our workshops in Howth. All this transformed the sad wreck of London T124 into a beautiful replica of Dublin No. 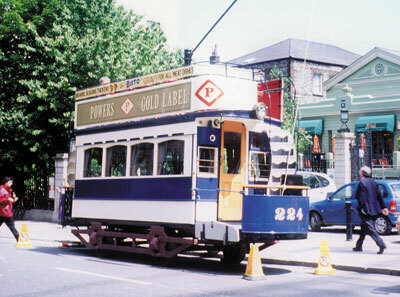 224, which made its first triumphal appearance on Bloomsday 2000. No. 224 has been a runaway success and had its first film role later in 2000 when it was used in the remake of The Magnificent Ambersons. It appeared at the Tourism and Coach Council Exhibition in the RDS last November, where it made an excellent impression on everybody who saw it. But much remains to be done, most obviously the lettering and lining out, and even when the tram is on display in Howth, work continues. The satisfaction experienced by everyone associated with this vehicle is tremendous and its restoration proves yet again what a small but determined group can do. Meanwhile, just as the first of Dublins new trams is about to go on display, this wonderful survivor from a hundred years ago reminds us powerfully of how completely things have changed in that time. Here is yet another matchless repository of social and technological history.